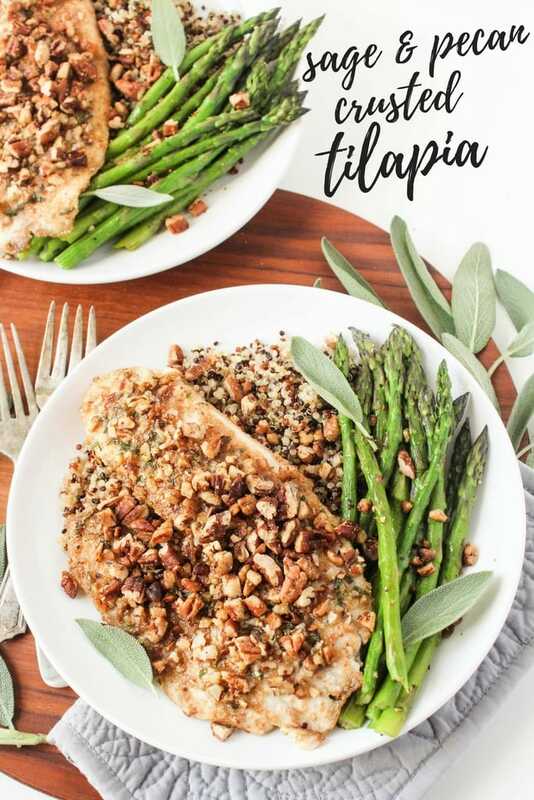 I’m continuing my partnership with Dish on Fish this month to bring you this quick and easy dinner recipe: Sage & Pecan Crusted Tilapia. 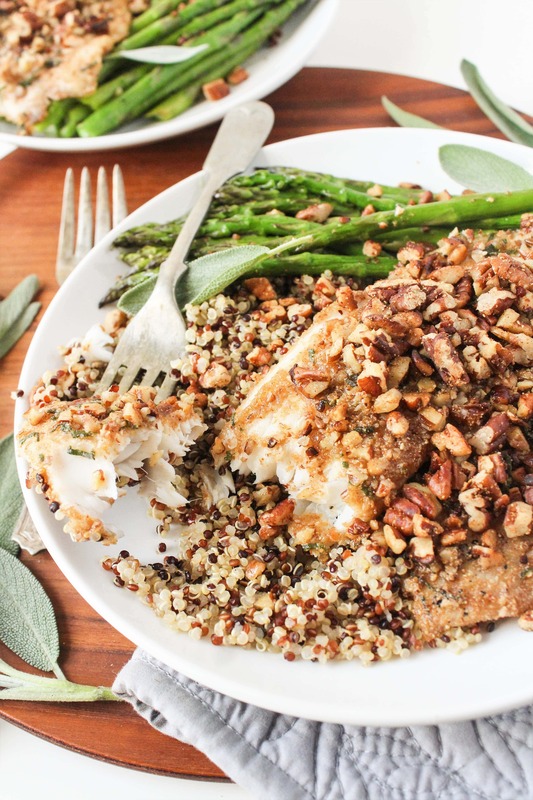 It’s nutty, savory, satisfying, and the perfect dinner to celebrate National Seafood Month! October is National Seafood Month and I’m celebrating again with Dish on Fish, an initiative of the National Fisheries institute to encourage Americans to eat more fish. As a dietitian and lover of seafood, I’m all about this initiative. Seafood is chock full of health benefits – see my post on why you should eat more seafood for more on that – and cooks quickly and easily, making it perfect for a weeknight dinner. 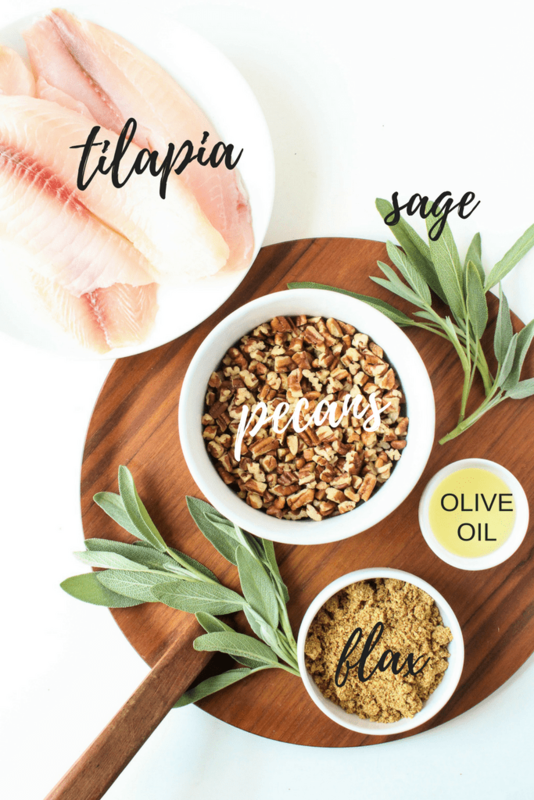 Check out the Dish on Fish blog (and their Twitter, FB, and Pinterest pages) for more seafood recipes and tons of useful health and nutrition information about fish. If you aren’t a huge fan of fish, tilapia is a great place to start. It’s very mild in flavor, so it doesn’t taste “fishy,” and it takes on bold flavors like the sage and pecans in this dish! And if you’re new to cooking fish or are intimidated by it, this recipe is a great place to start for you, too. Tilapia is flaky and cooks quickly, so it’s hard to mess up. This recipe is inspired by one of the most popular recipes on my blog: Almond Crusted Tilapia. Although I love the crunch that almonds bring to the mix, I wanted something with more of a fall flair. Swapping the almonds for pecans brings a toasty, buttery flavor to the mix, and adding earthy, fragrant fresh sage to anything instantly makes me think of fall. 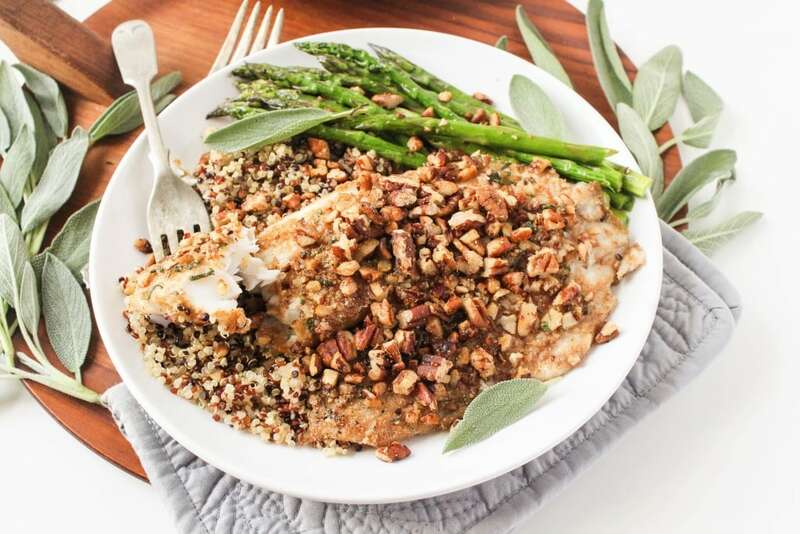 The result is a more savory, earthy nut-crusted tilapia that feels like comfort food but is still quick and easy to make. And for my gluten free friends, this recipe also happens to be gluten free! 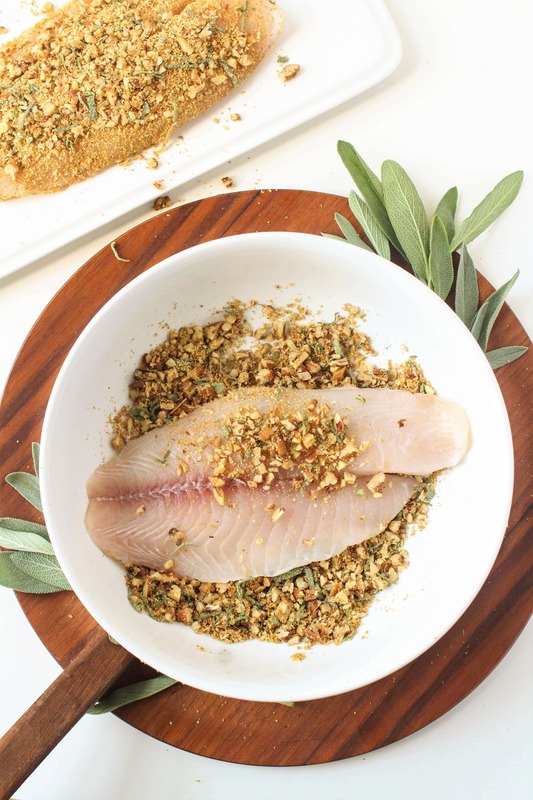 Just mix ground flaxseed with finely chopped pecans and sage for the crunchy crust and dredge your tilapia fillets in the mixture. Next, cook the tilapia until it’s flaky and tender – just 3-4 minutes on each side! Don’t stress if some of the pecans fall off when you transfer the tilapia to the pan. 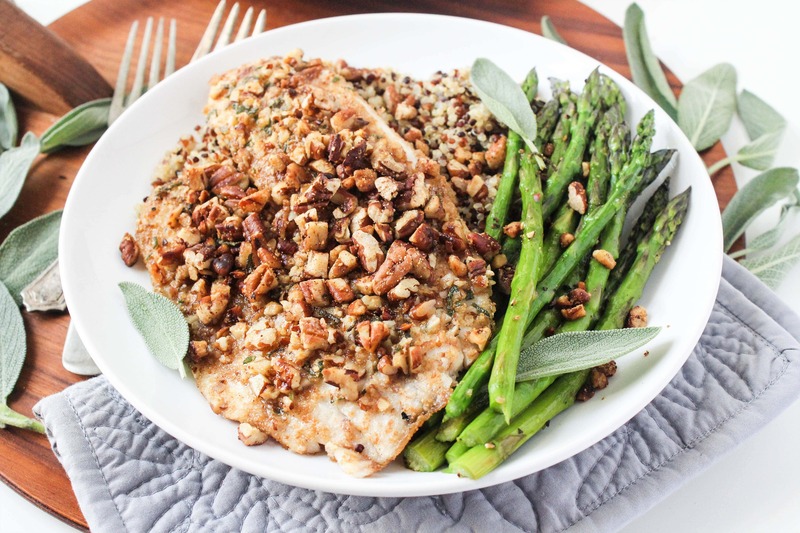 Just press down on the tilapia with a spatula while it’s cooking, and the pecans will form a crunchy crust! Once all the fish is cooked, toast up some larger pecan pieces in the same pan. They absorb all the flavor and toasty bits left in the pan and add extra crunch when sprinkled on top of everything! So good – toasted nuts are the BEST. 1. Using a food processor or large knife, chop 1/2 cup of the pecans until very finely chopped. 2. Combine the finely chopped pecans, flax meal, salt, and sage in a large, shallow dish. 3. Press the tilapia filets into the pecan mixture to coat. 4. Heat half of the olive oil in a large saute pan over medium-high heat. Add two of the tilapia filets. Don't worry if the pecans don't stick - just push any larger pieces under the tilapia and press down firmly; they'll bind to the tilapia better as it cooks. 5. Cook the tilapia for 3-4 minutes on each side, until the pecan mixture is fragrant and the fish flakes easily with a fork. Repeat this process with the remaining olive oil and two tilapia filets. 6. 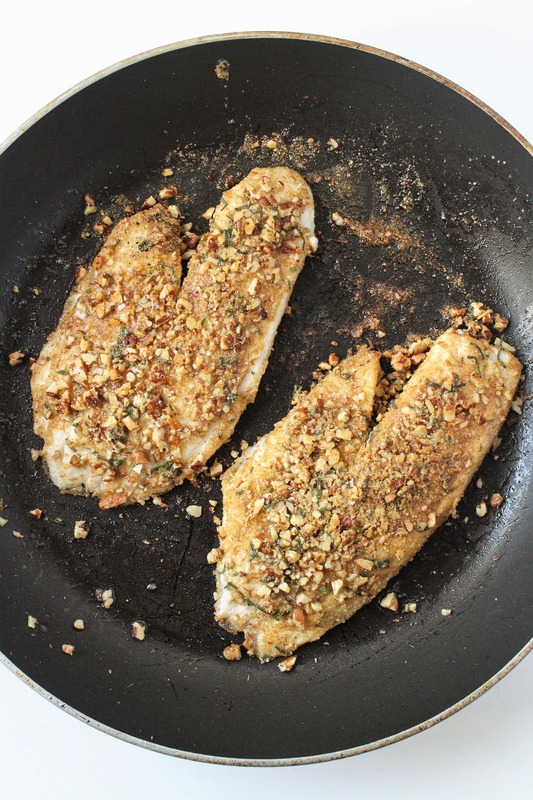 Once all the tilapia is cooked, add the remaining 1/2 cup of roughly chopped pecans to the pan. Cook, stirring constantly, until fragrant. 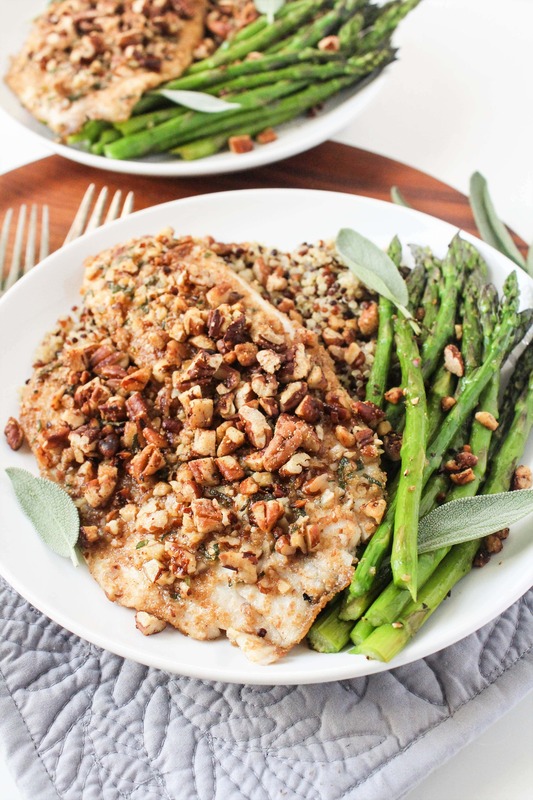 Sprinkle the toasted pecans on top of the tilapia and serve with quinoa and roasted veggies. Want more easy seafood recipes? Here are some of my favorites! What’s your favorite easy weeknight fish recipe? This is a sponsored conversation written by me on behalf of Dish on Fish. The opinions and text are all mine. This is perfect! I NEVER know what to do with tilapia– it seems so boring, but my goodness, I would make this recipe in a heartbeat! I LOVE pecans! Looks super! And love tilapia! Thanks! Look forward to trying it.